Republican Rep. John Blust criticized his colleagues Friday for becoming entangled in a subject they don’t know much about — the judiciary. “Why do we want to take on one more thing that may not be an area we have expertise when we claim we have limited time and we can’t get to so many important subjects because of that limited time?” he asked. He was responding to Rep. Justin Burr’s (R-Montgomery, Stanly) resurrection of two bills that passed the House last session that would take judicial appointment power from the Governor and reallocate it to the General Assembly. 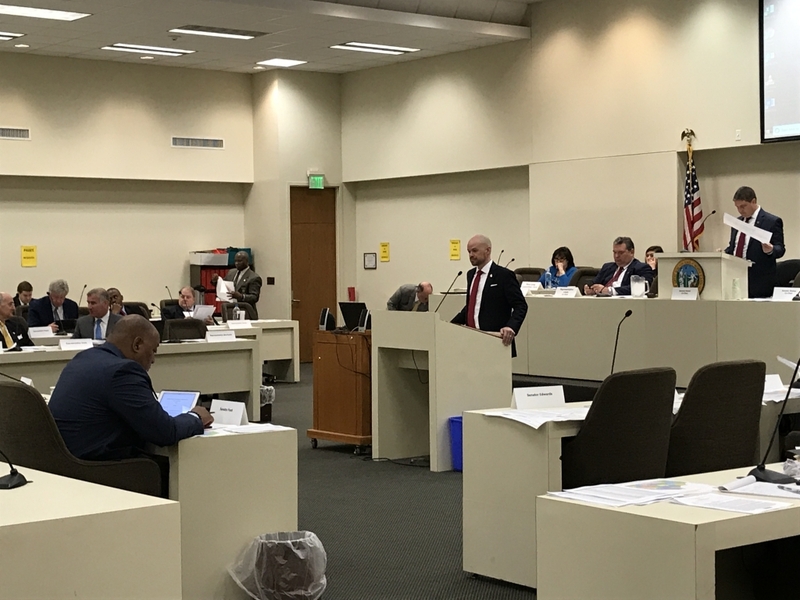 House Bills 240 and 241 were discussed in the joint committee on Judicial Reform and Redistricting, along with three judicial map options that were introduced earlier this year. HB240 involves judicial appointments to district court vacancies and HB241 involves judicial appointments to special superior court vacancies. Gov. Roy Cooper currently has the power to make those appointments with some input from the Bar, but Burr says the General Assembly would provide a more open and transparent process with opportunity for public input. It was an exaggeration that several lawmakers, who also happen to be attorneys, pointed out, noting that the Bar is usually actively involved in the nomination process. Several other lawmakers, including Blust, noted that timing would be an issue, particularly for district court, if lawmakers weren’t in session to make appointments right away when vacancies occur. Each bill, however, allows for the Speaker of the House and the Senate President Pro Tem to submit a nomination to the Governor if lawmakers are not in session (without public input). Rep. Robert Reives II (D-Chatham, Lee) took issue with that. He said that his constituents already don’t believe that lawmakers work with a lot of transparency, and that given their perception, he doesn’t see how HB240 and HB241 would help. “I have a huge concern about the General Assembly making any judicial appointments in this manner because again, I feel like it’s infringing even further on the judicial branch of government, which is a completely separate branch of government,” he added. Blust also took issue with with the overreach of power the bill seems to give lawmakers. “One thing about the General Assembly, either party, a few people hold most of the cards, and they can make the decision — even if you think they’re not making the decision, they can bring so much power to sway,” he said. Sen. Warren Daniel (R-Burke, Cleveland), a co-chair on the committee, described HB240 and HB241 as “forms of merit selection” and said they did not receive a mandate from leadership to discuss those two measures. Neither he nor Sen. Dan Bishop (R-Mecklenburg) what momentum was currently behind those bills or a measure for judicial redistricting. Bishop said the reason lawmakers were looking at appointing vacancies to district court and special superior court judgeships is because they didn’t require constitutional amendments. Bishop said he believes there is a high priority to fixing Mecklenburg County, where there is reportedly population discrepancies in the judicial districts, but he also didn’t show support for any one full map of the nine that have been introduced. The judicial election ballots have to be printed by Sept. 7. In the meantime, judges are uncertain about how they will be affected or if they should move to avoid double-bunking. When asked if they would be comfortable with the current process if the tables were turned and lawmakers were dealing with legislative maps, Bishop and Daniel wouldn’t answer the question directly — they just acknowledged taking into consideration a transition period.